A tempting and healthy way to have more fun with your fruit. 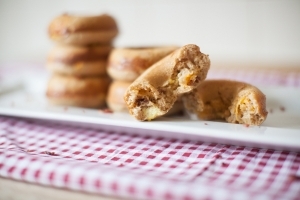 It's a hearty breakfast sandwich baked in to a delightfully light cake doughnut. Prepare the egg and bacon separately and set aside. Combine the dry ingredients together in one bowl. In a separate bowl, combine the wet ingredients (through vanilla). Then, slowly fold the dry ingredients in to the wet. Mist a doughnut pan with cooking spray, then pour in the batter only filling the molds about 1/4 full. Evenly divided the scrambled eggs, crumbled bacon, and shredded cheese over the batter. Then top with the remaining batter, filling the molds mostly full. Bake for 10-12 minutes or until golden brown. The doughnuts should pop right out of the molds.